The Edel reissues of the Sonic Zoom catalogue hasn’t been much to write home about so far, with covers which look more like Jackie Collins airport paperbacks, poor remastering and a mess of bonus odds and ends from other CDs to try and lure people into buying them all over again. The series now suddenly takes a step sideways for the next release, as it’s an “unissued” recording. Graz (in Austria) on April 3. 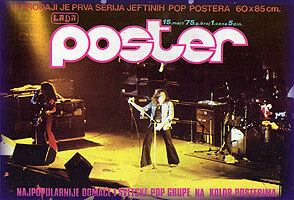 1975 is one of the shows taped for what became EMI’s Made In Europe album after the band split. Five tracks from the show later surfaced on the Connoisseur label double set Mk 3 Final Concerts. The press release for this new edition (“the holy grail of concert recordings”) suggests the show is now intact and complete, although complete without the usual encores (as far as I recall the band didn’t do a wobbler after Space Truckin’!). There have been rumours of some tiny edits to get the rest of the show onto a single disc, let’s hope this is not the case. 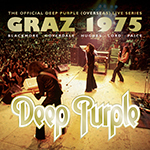 It’s due out on 1CD and a double album, complete with an atmospheric live cover shot – which looks to come not from Graz but one of the big stadium shows in America on Purple’s tour there the previous year. And that’s my beef with this series really, glossy but with no real love or depth to it. I did a side by side with the ‘MkIII final concerts’ disc and it’s a much more open sound with the drums much more prominent (but not overly so) – also you can hear Jon Lord DURING the songs. I was anticipating an ‘everything louder than everything else’ approach, but NO, this is how bands sound live (at least the bands that I’ve seen – maybe it’s different these days…). Of course the ‘complete concert’ sticker must be breaking every international rule on truthfulness, but what annoyed me most was the incomplete You Fool No One – as per Connoisseur’s ‘MkIII cd’ – am I really the only person who likes Ian’s drum solos?! Timothy Campbell. Ahh, MK III Purple, my second favourite lineup of the band. 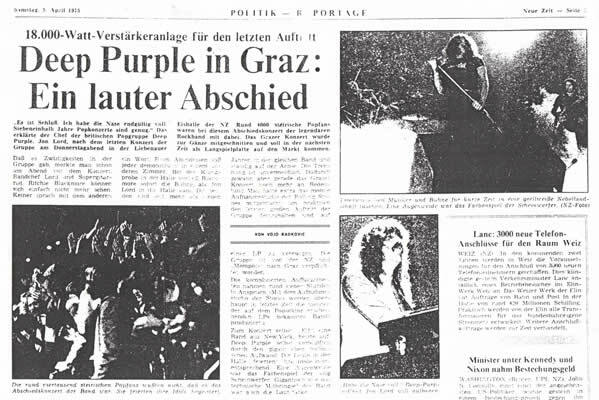 Which means it’s guitarist Ritchie Blackmore, singer David Coverdale, bassist/vocalist Glenn Hughes, keyboard player Jon Lord and drummer Ian Paice who performed at the Liebenauer ice rink, on the outskirts Graz, Austria back in 1975. It was also the third last show that Blackmore would play with the band, before riding the Rainbow for a few years, so the Rolling Stones mobile was in tow to try and capture the magic. And if you’ve heard this show before (and you shouldn’t have unless you bought “Mk III: The Final Concerts” back in 1996, which had ‘Mistreated’ and ‘You Fool No One’ on disc two from this show), then you’re in for a treat. It’s the first time, the whole show has been officially released, and it’s a lot better than some of the other Mk III live music that’s been out there for years. The version of ‘Burn’ that opens the set is already in my Top 5 versions, and the first half of the show is just spectacular, as they rip through ‘Stormbringer’, ‘The Gypsy’, ‘Lady Double Dealer’ and ‘Mistreated’, with even ‘Mistreated’ managing to overcome it’s lumpen qualities. Then it’s time to roll back the years, with (natch) ‘Smoke On The Water’ before a blistering version of ‘You Fool No One’ and a closing ‘Space Truckin’. Considering he was working his notice, Mr Blackmore is in fiery form, and this is a record that should ensure your copy of “Made In Europe” stays out of circulation for a long time, especially if you pony up for the vinyl version. I’d just like to chime in to say the sound is not that great to my ears – Martin Birch knew what he was doing, and the sound on the Mk III Final Concerts is much superior to my ears. Also, both Hughes and Coverdale’s vocals, while starting out strongly on “Burn,” seem to get more off-key as the concert progresses – road fatigue, probably. Horrible job on Edel’s part. I was going to buy this, but not now after hearing about the edits that were made. What’s the point of making it if they’re not going to release the whole show? It’s more than the drum solo that’s missing, it’s half the guitar solo and a verse of song, plus the encores. In my opinion this cd/2lp is one of DP’s greatest live recordings and definitely the best of this line up. “Burn”, “Stormbringer”, “The Gypsy” and “Space Truckin'” are absolutely amazing. But what about the encore? I think there was also a drum solo. I’m looking forward for further complete recordings.